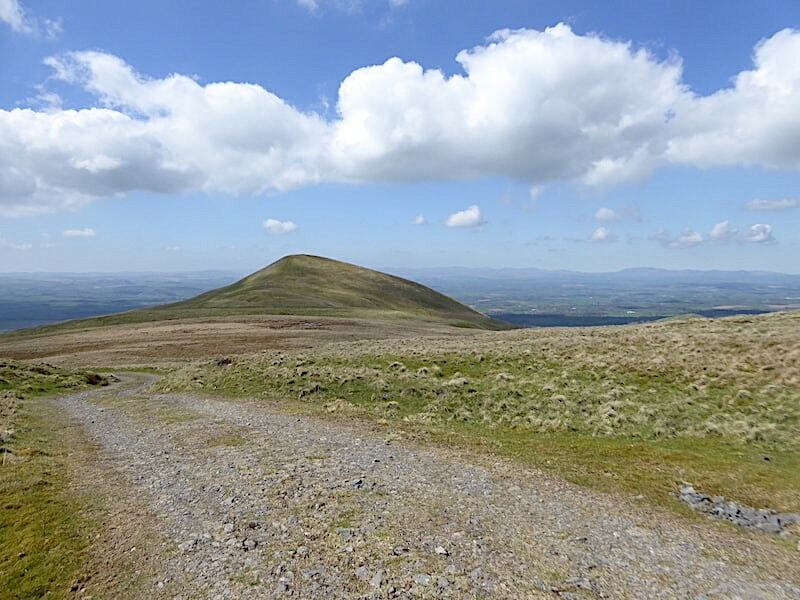 A sunny Bank Holiday weekend would mean a very busy Lake District so rather than add to the traffic congestion and parking difficulties we stayed close to home and drove just a few miles across the Eden Valley to Murton village for a walk up Murton Pike and then on to High Cup Nick. 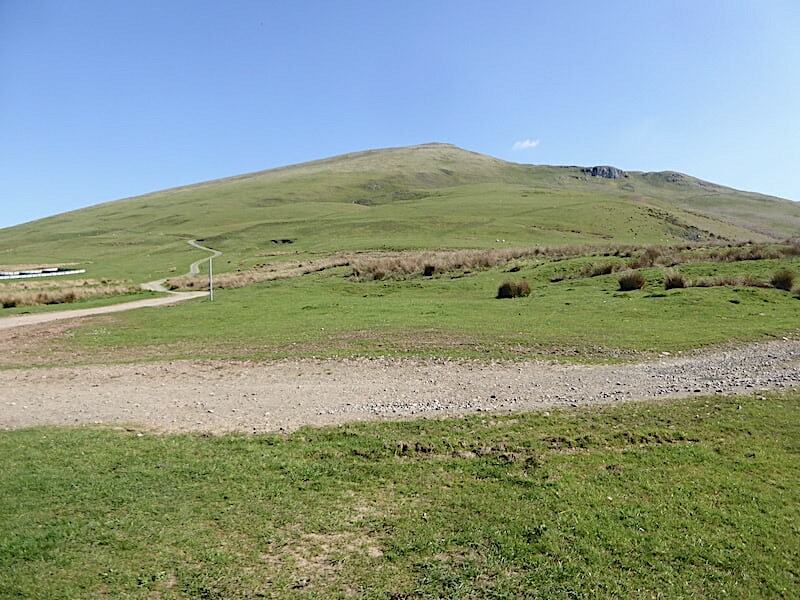 Easy parking, good paths, no crowds and beautiful weather, what more could anyone want? 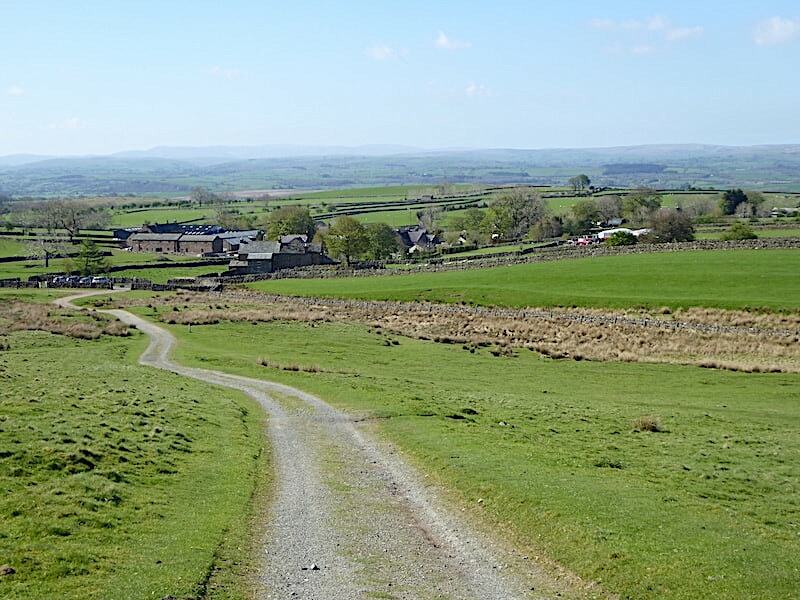 A beautiful, warm sunny morning and we’re parked in the spacious car park at the top of Murton village, more or less at the foot of Murton Fell. There’s no doubt about where the start of the path is or where it goes so it would be difficult to go astray. 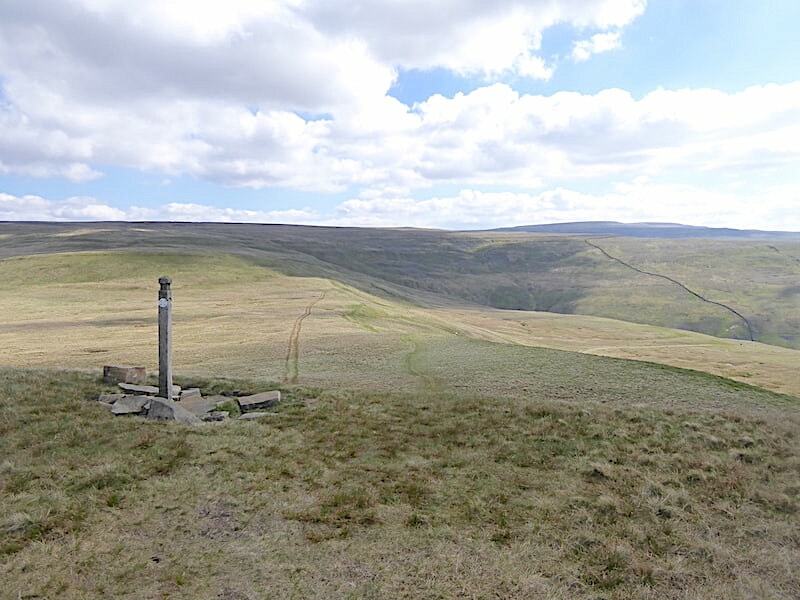 Beside an information board by the car park wall there is a handgate, pass through that and the track is right in front of you, and from there it winds steadily upwards over on the left. Only three cars are already parked, the occupant of one of them still getting geared up, and we exchange greetings as we do the same. 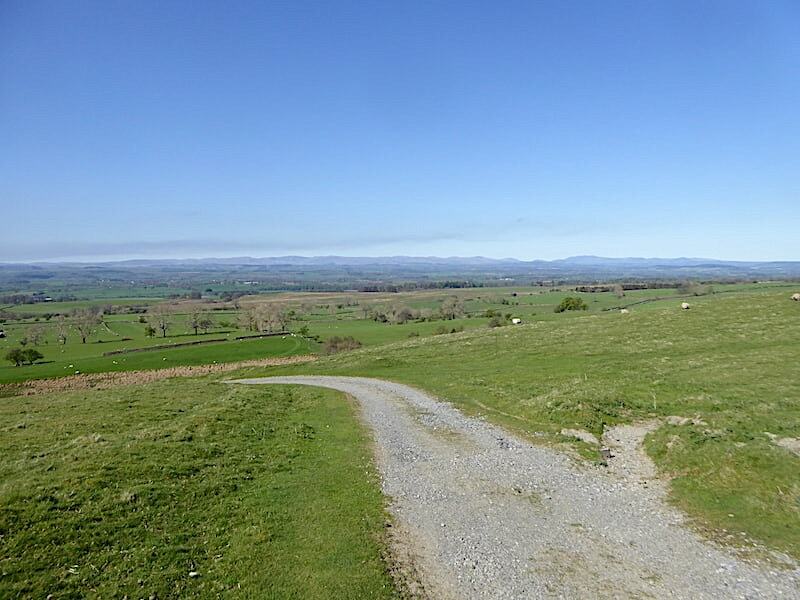 We start the steady walk up the wide track taking a look back at the car park and Murton village just below it …..
….. while on the distant skyline, across the Eden Valley, the Lake District’s fells are practically filling the entire horizon. A closer look at them reveals High Street, more or less in the centre, with Kidsty Pike to the right, then Mardale Ill Bell and Harter Fell over to the left followed by …..
…..a look over to my right for a closer look at the unmistakeable silhouette of Blencathra and …..
….. then left down to the south for a view of the smoky grey bulk of Wild Boar Fell. 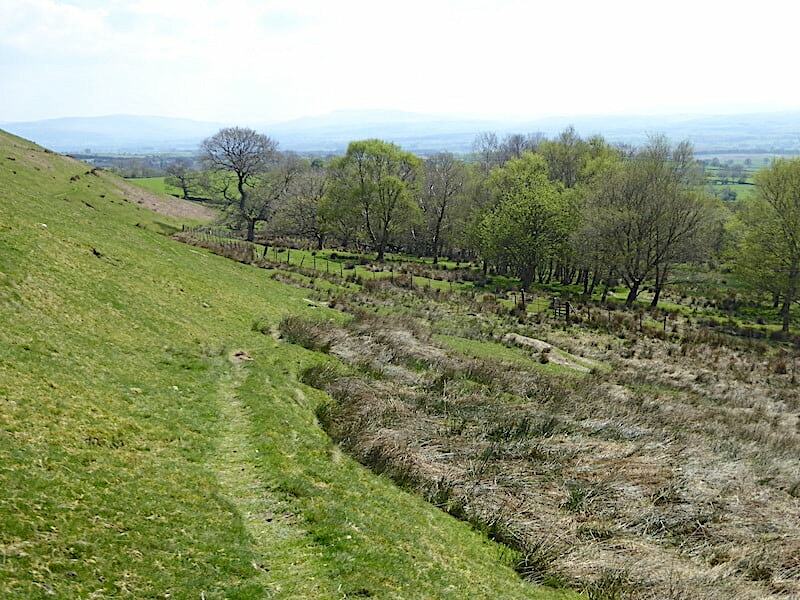 The track curves across the fellside from where there’s a good view back down to the village and the car park where there is still just our car and the three others. I don’t suppose that would be the situation in the car parks and lay-bys over in the Lakes today. 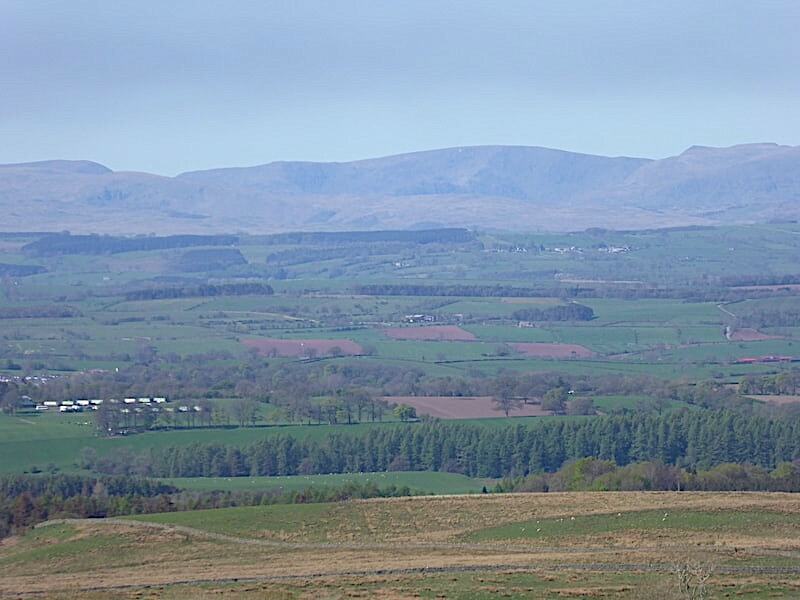 Immediately across from us is Delfekirk Scar, the prominent escarpment sitting at the south western end of Mell Fell, and beyond that is Roman Fell. 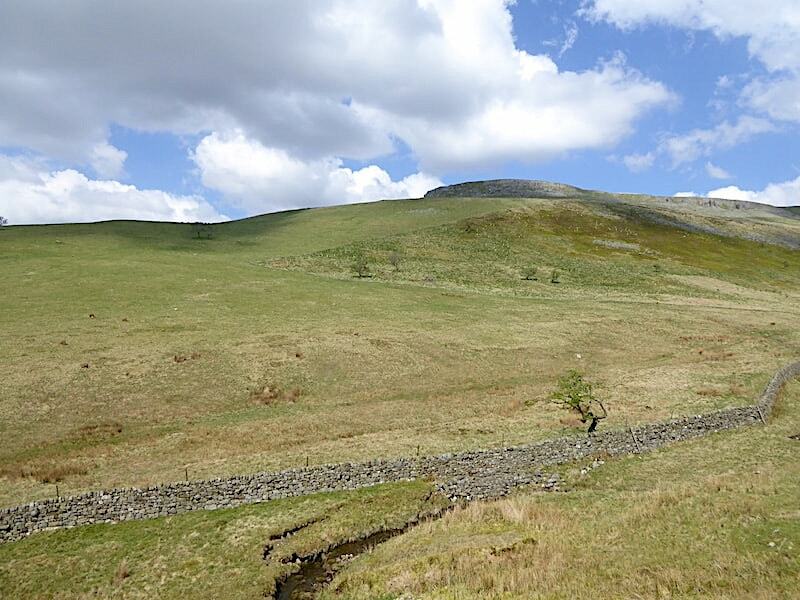 Access to Roman Fell and other parts of the area over there can be difficult as it is used in military training, although access is possible at times. 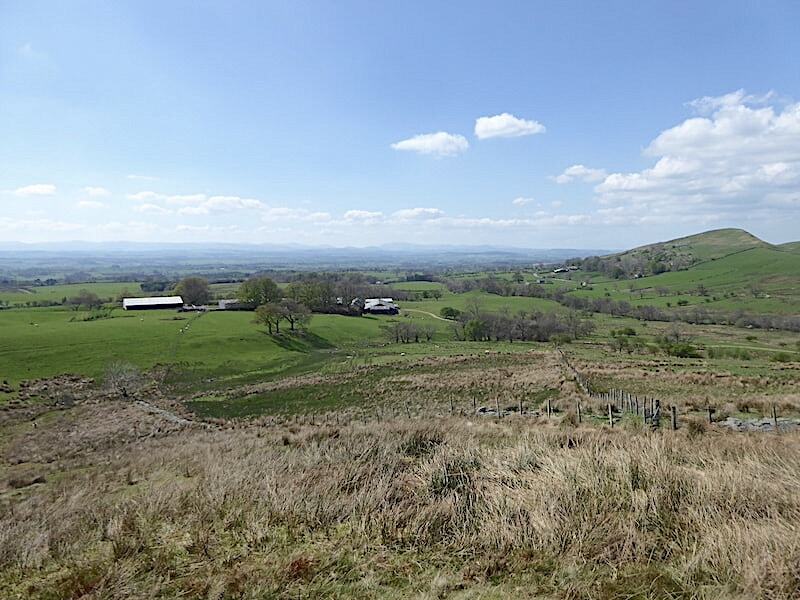 After a steady uphill climb we reach a short level stretch below Murton Crag and have a brow mopping stop. Its not a very steep track but it does climb steadily and although it isn’t a lung buster by any means its enough to get the blood pumping. The sun bearing down on us made it very warm work indeed although we did have the benefit of a very slight breeze which helped quite a bit. 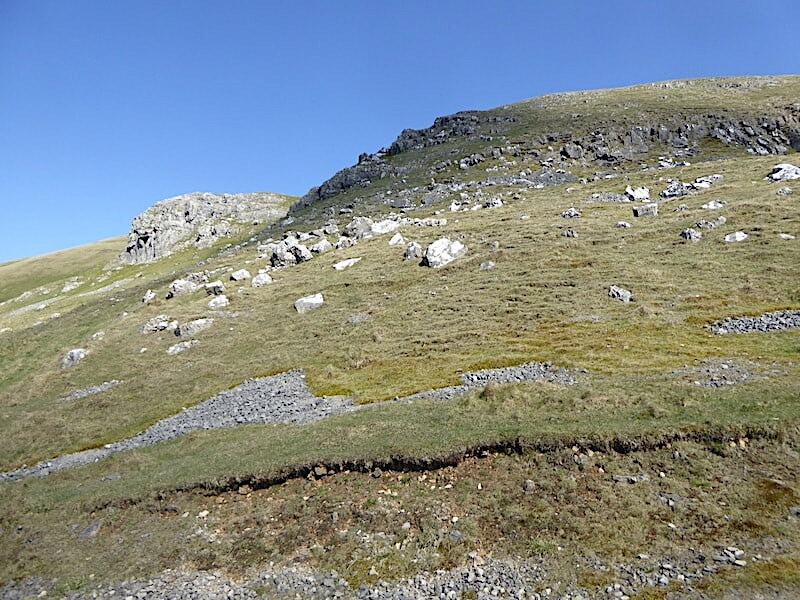 A look up at Murton Crag as we pass below it. 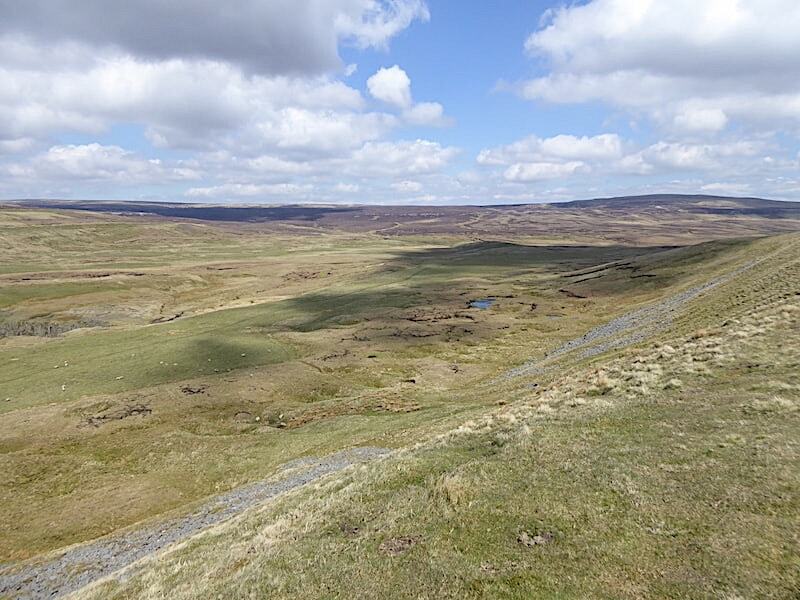 Below us is Gasdale and on the slopes above it is the old lead mining area known as White Mines. A closer look at the mining area, which reminds us of the similar workings we saw in Great Rundale back in March. 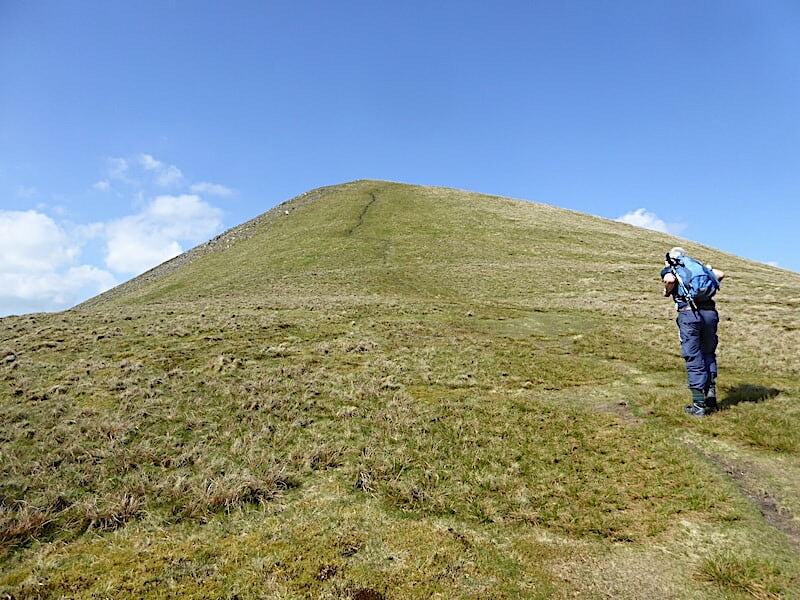 The ridge line to the conical top of Murton Pike as we continue walking up the track …..
….. which we branched off from just a little further along. We could have continued along the track and then turned off to walk across the ridge line but we left the track at this point just to cut the corner off. 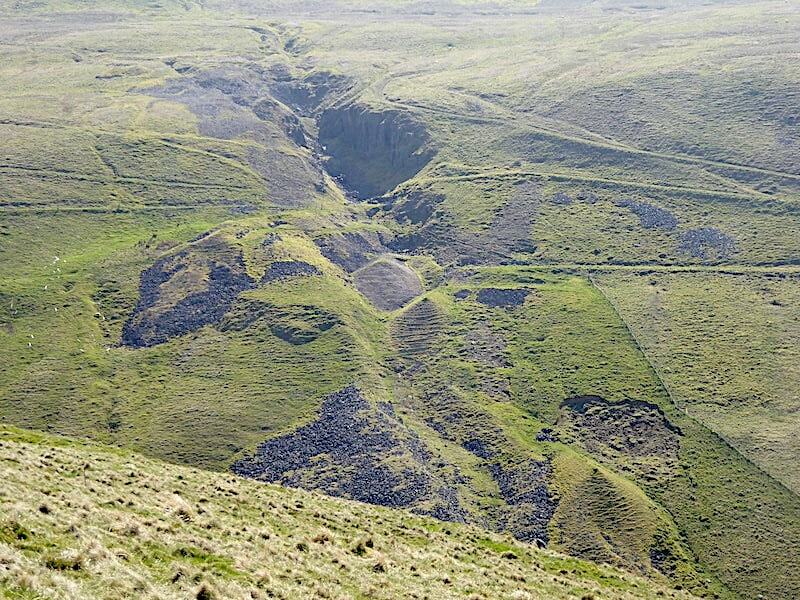 The deep scar of White Mines can be seen just about where the track drops down and disappears from view to the left of Delfekirk Scar. On reaching the ridge line there’s not a lot else to see other than the steep grassy slope and the path up to the summit. Its still warm work but at least the breeze is a little stronger and cooler up here which made the climb a whole lot more comfortable than it might otherwise have been. One team member decided not to wear his shorts and subsequently wished he had. I was glad I’d been wearing mine from the start. 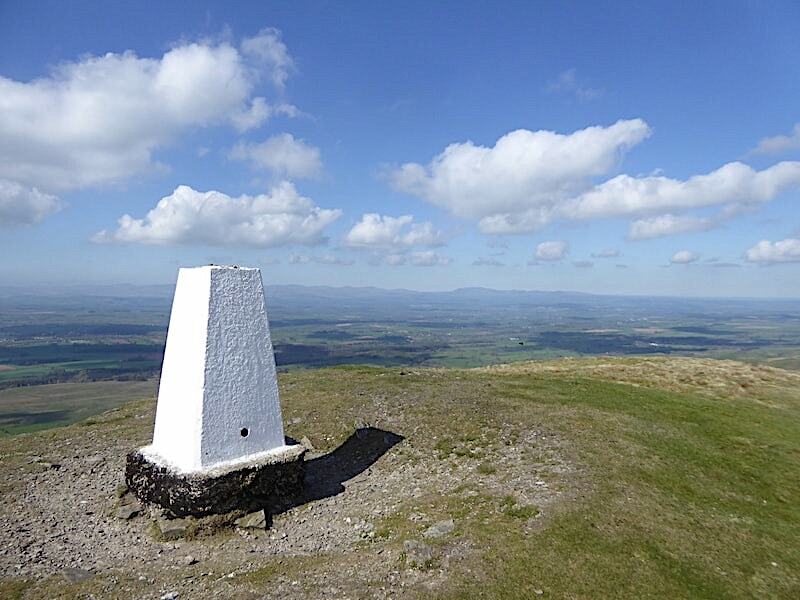 Murton Pike summit, at 594m/1810′, and a view across the Eden Valley towards the Lake District fells, with Blencathra and the northern fells on the skyline to the right of the gleaming white trig point. 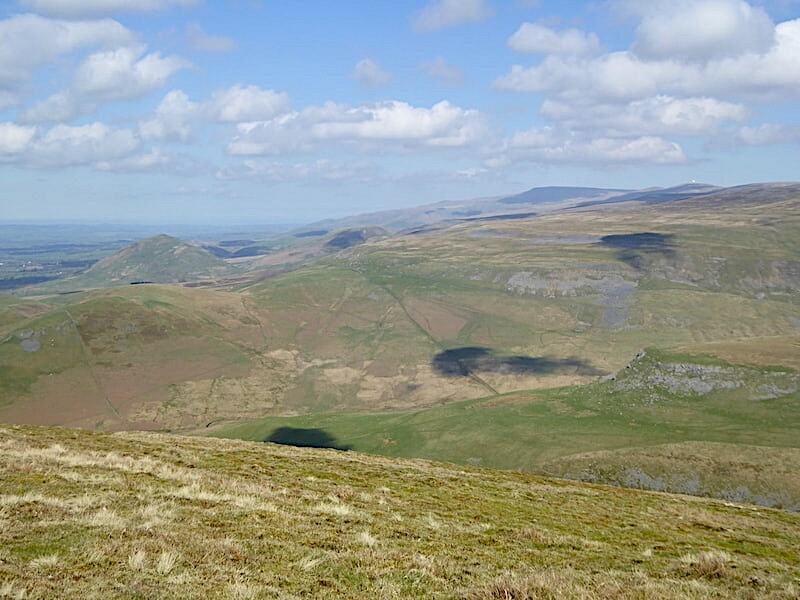 We take a break and sit in the sunshine to take in the views, with another walker out of shot to the left doing just the same. 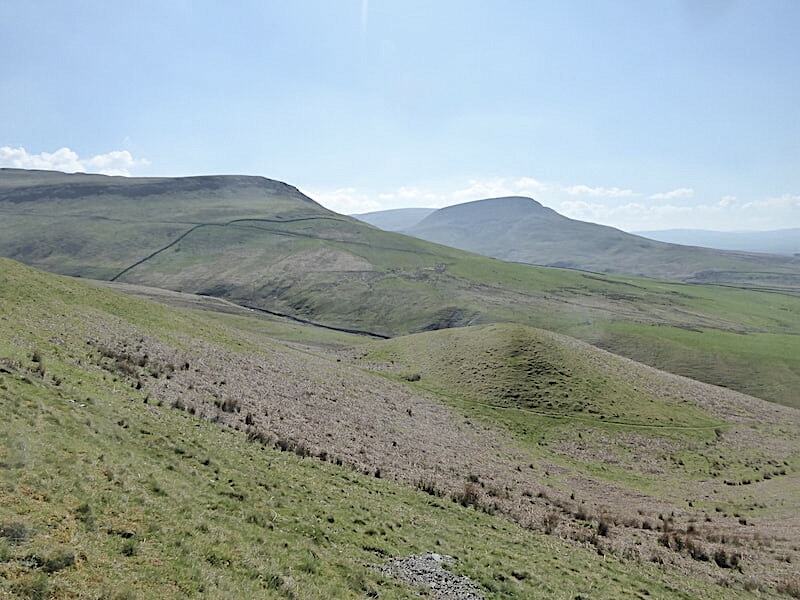 The small hill over to the left is Dufton Pike and just below us on the right is the limestone scar on Middle Tongue. 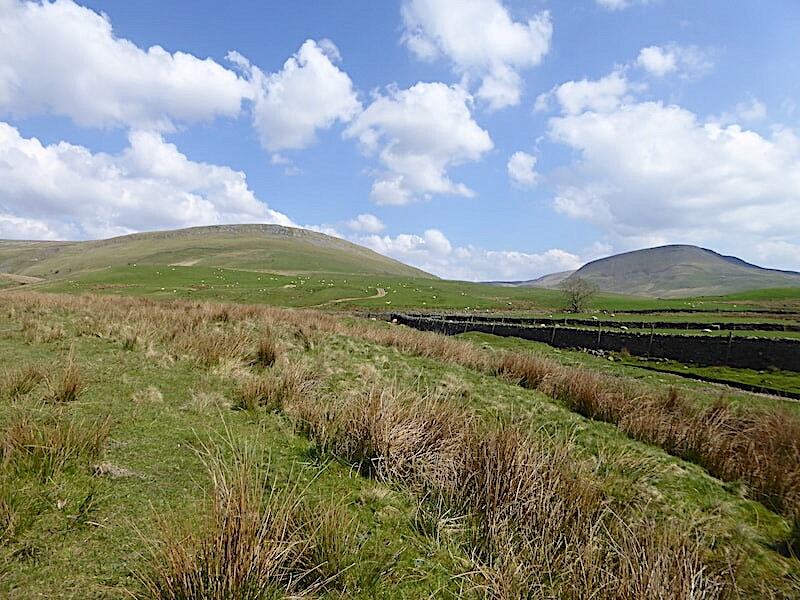 The dark peak on the skyline is Cross Fell with the white radome on Great Dun Fell clearly visible today. 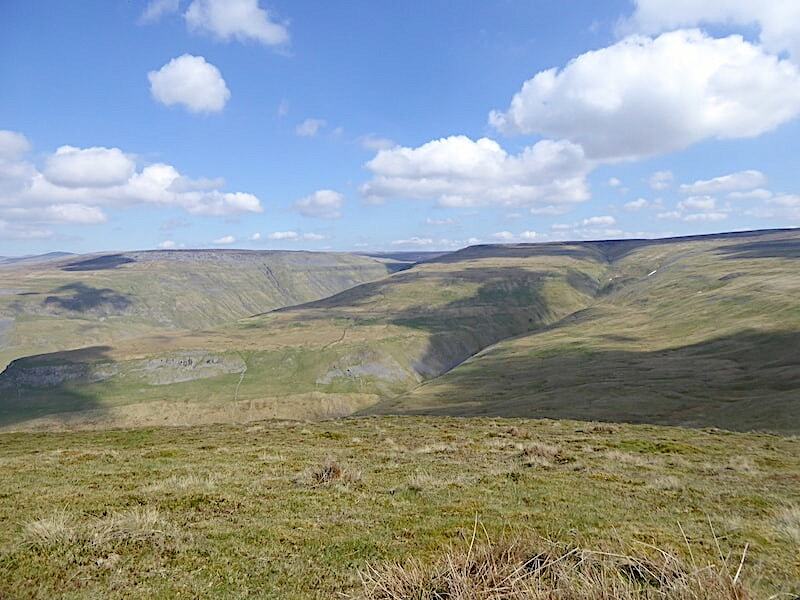 Occasional patches of snow still linger on the slopes of Murton Fell which is separated from its neighbour Middle Tongue, in the centre, by Trundale Gill. 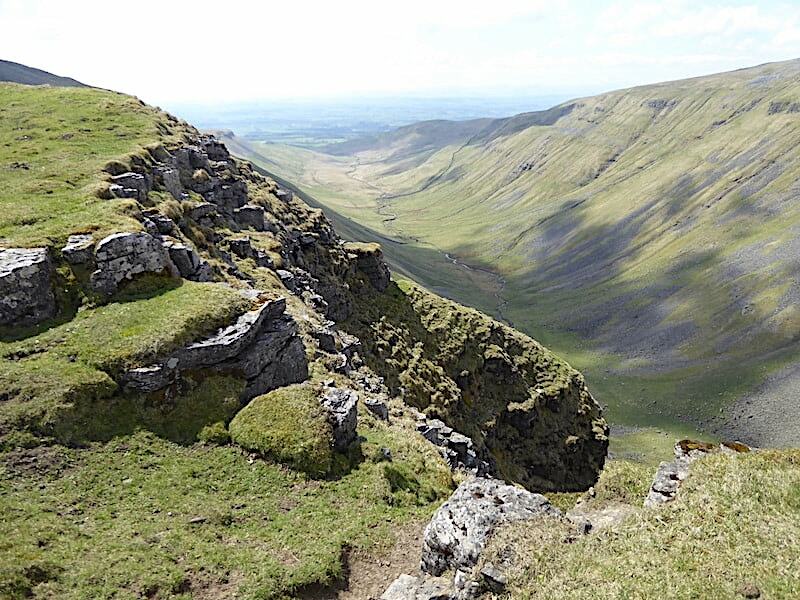 After our break we’ll be walking across Murton Fell, crossing Trundale Gill and then making our way over to High Cup Nick, the northern slopes of which are visible on the left of the shot. 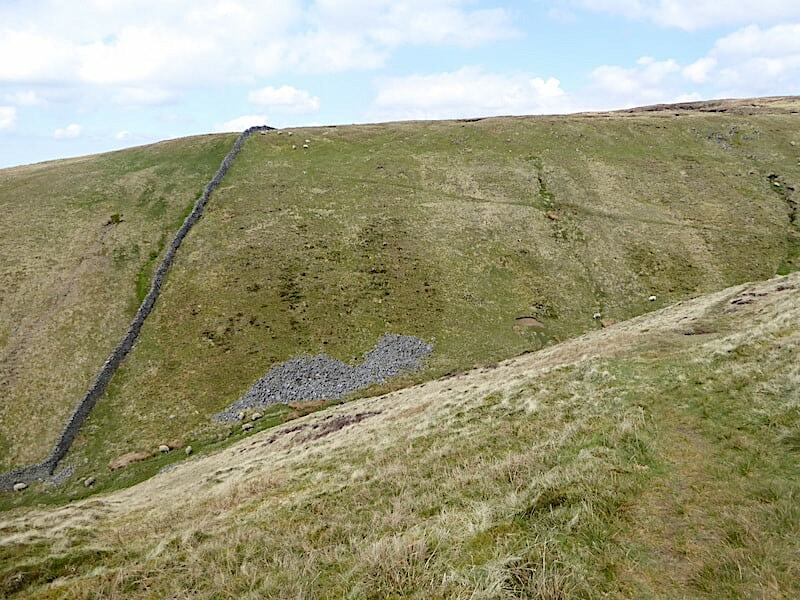 We hoist our packs, descend Murton Pike and walk the path to the right of the guide post which will rejoin the main track we left earlier. 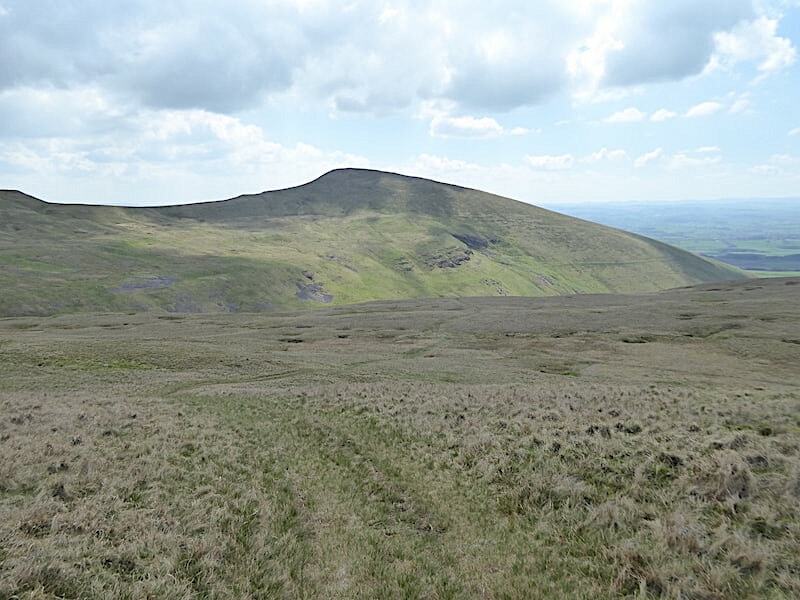 A look back at Murton Pike as we rejoin the track …..
….. which continues for some distance across the open fell until …..
….. it peters out at this waymark post, approximately at the 600m/1960′ height, where we bear left across the well trodden grassy moorland. 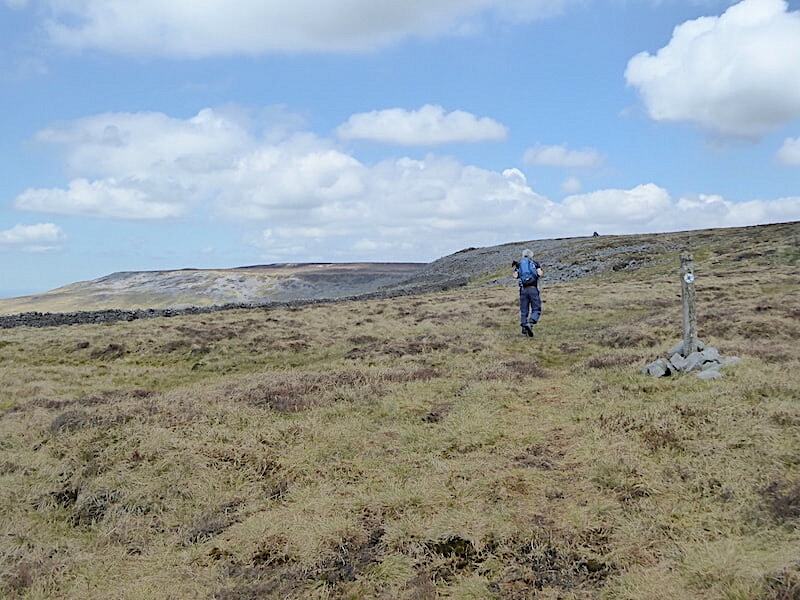 The landscape is largely featureless, with occasional grouse butts appearing from time to time, but the route is well provided with waymark posts and in today’s conditions the way ahead is clear to see. 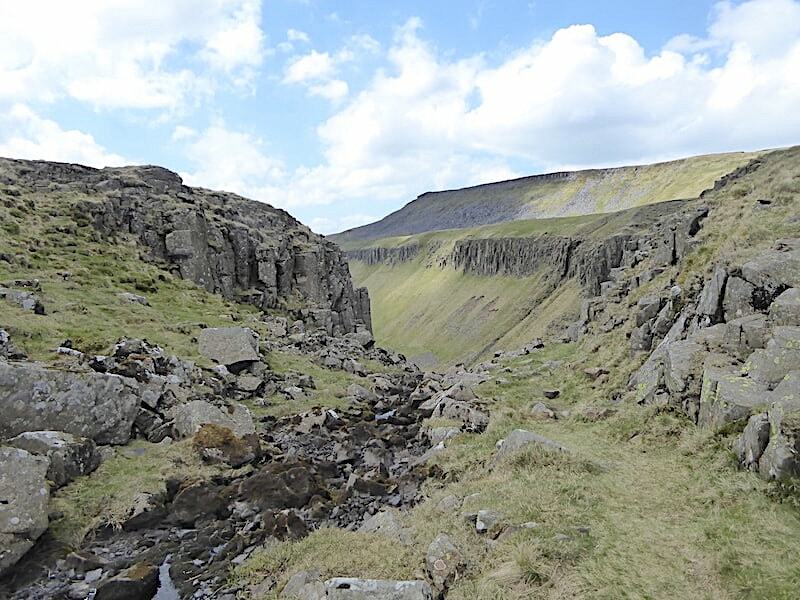 We had expected to encounter plenty of squelchy conditions but for the most part the conditions underfoot were firm and dry so we had a very enjoyable and trouble free stroll across to Trundale Gill. 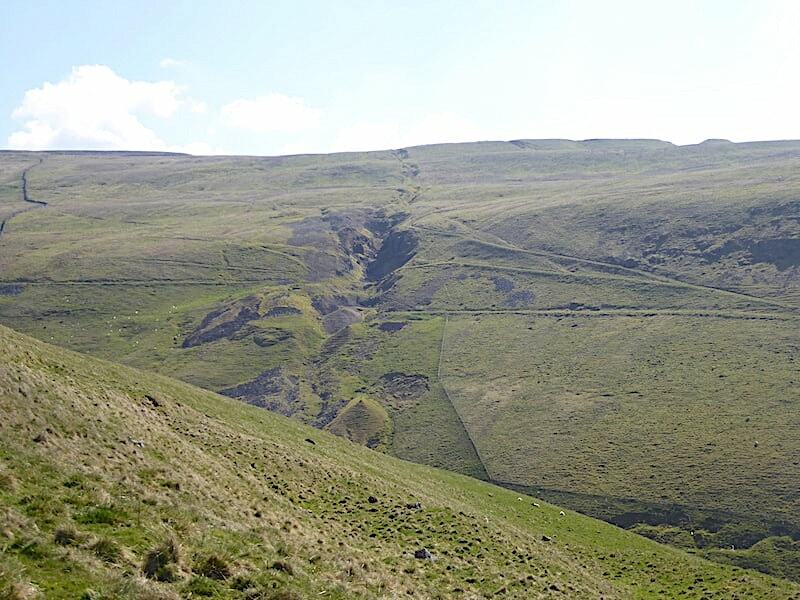 The path drops down into Trundale Gill and rises on the opposite side onto Middle Tongue. Neither the downward or rising paths present any difficulties. 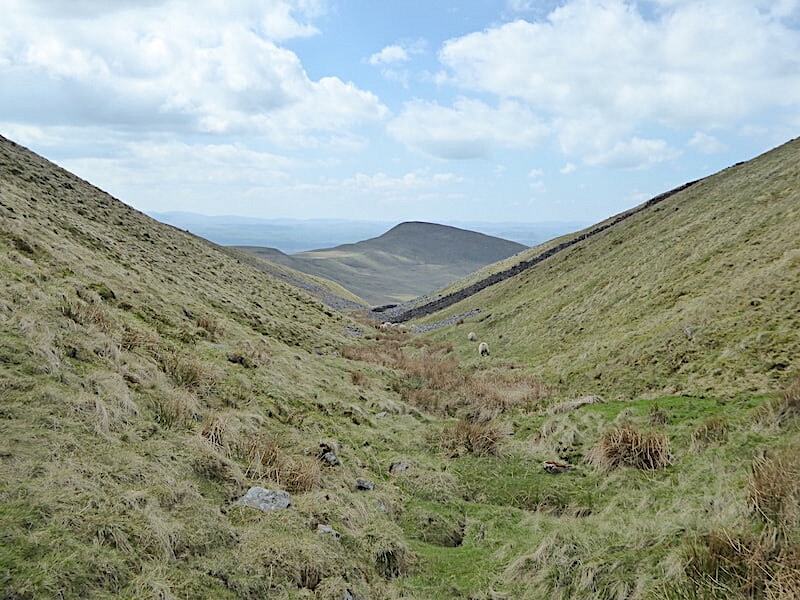 A view down to Murton Pike as we cross Trundale Gill. 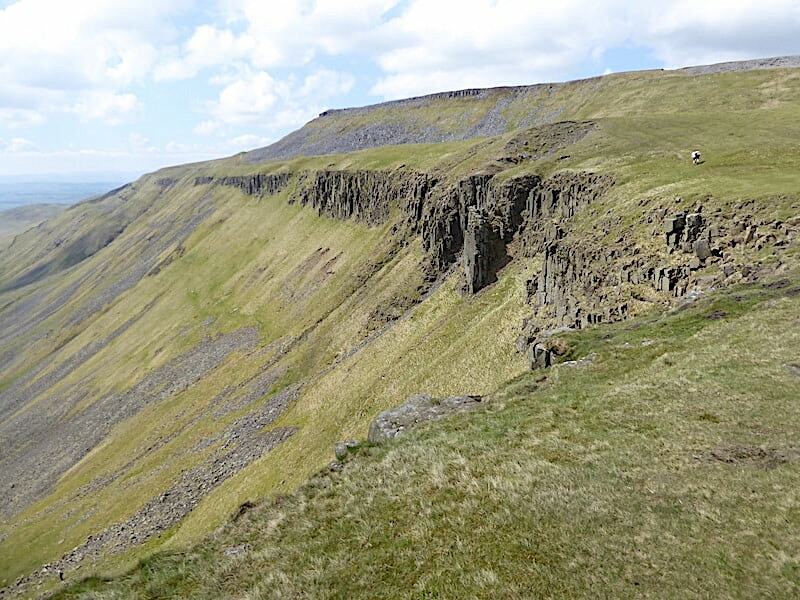 Another guide post appears keeping us on the straight and narrow across over to High Cup Scar. 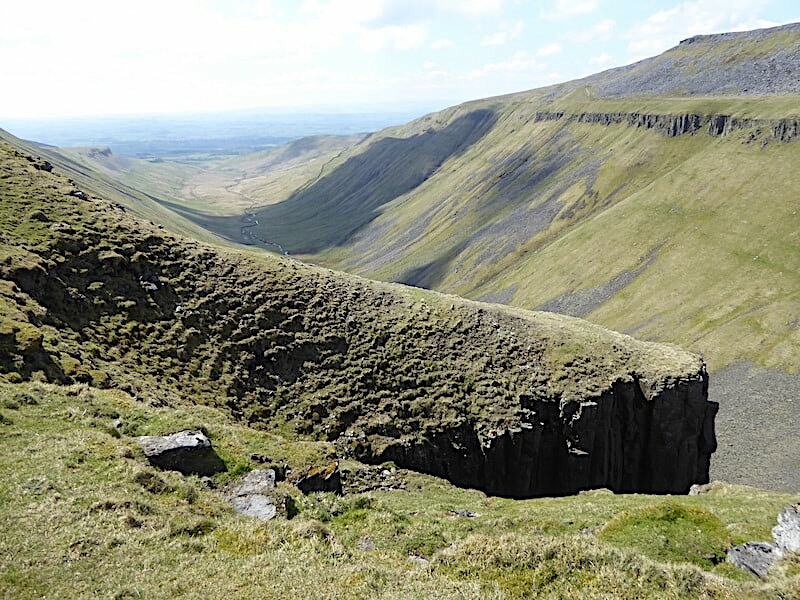 We remain on the higher path across High Cup Scar and will return via the one closer to the edge below us. 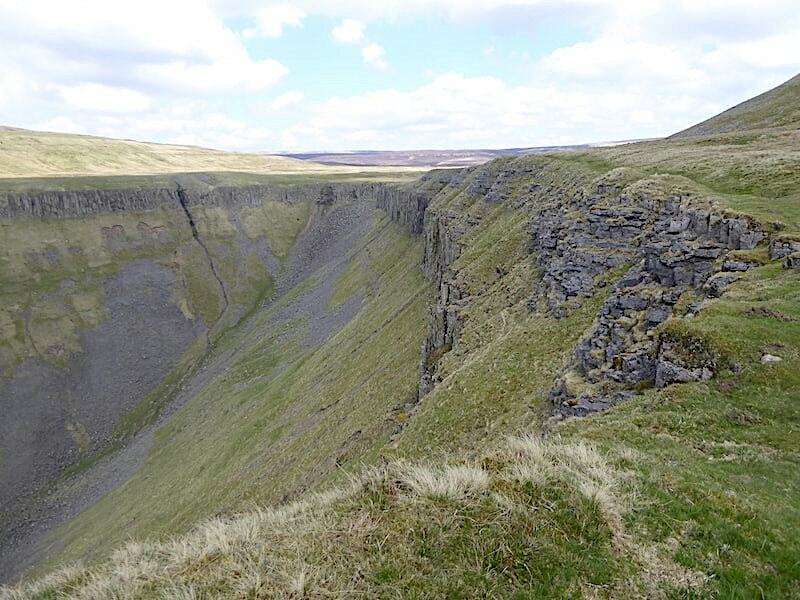 The deep ravine of High Cup Gill lies between us and the limestone escarpments of Dufton Fell. 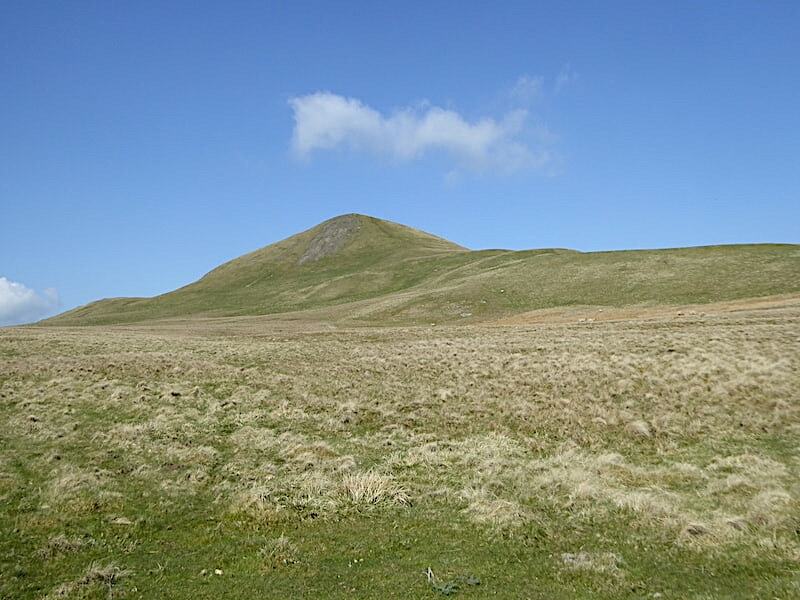 Great Rundale Tarn, which we walked up to in March, is situated at the northern end of Dufton Pike’s vast plateau. 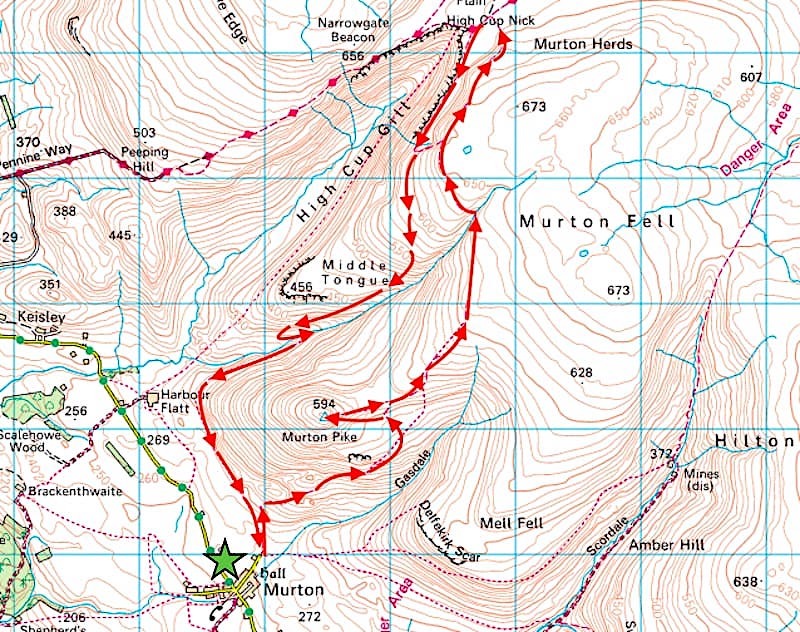 Curricks, or cairns, on the right above us mark the 673m/2208′ height of Murton Fell. 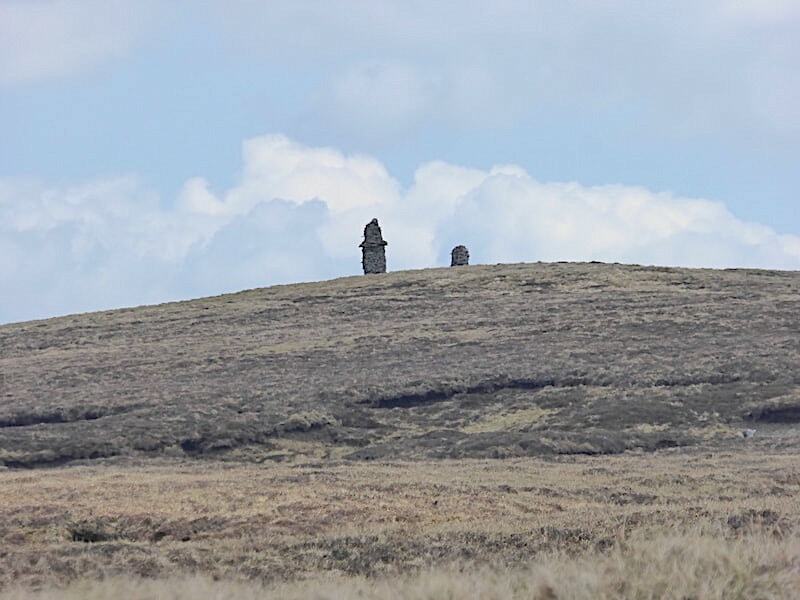 The tall one looked very similar in construction to the monument on Latterbarrow. 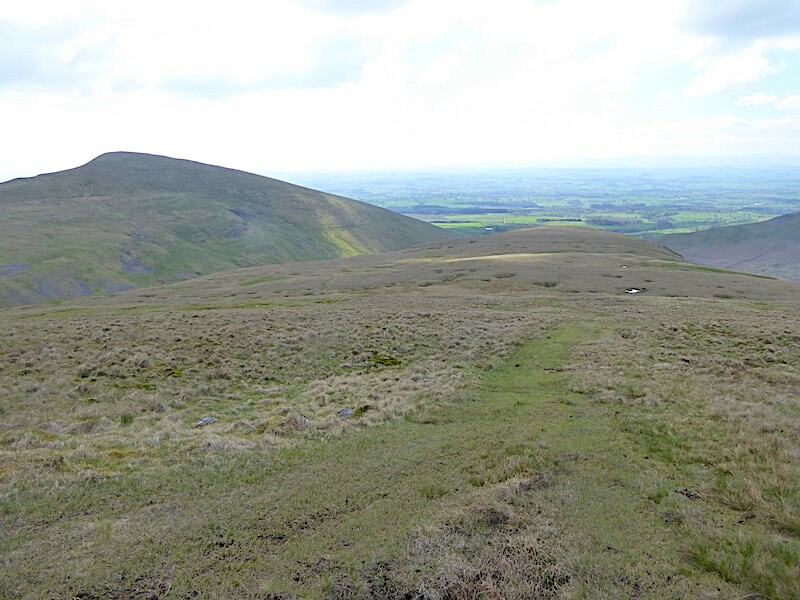 Apart from the lone walker taking a break on Murton Pike we have seen no other walkers along our route. 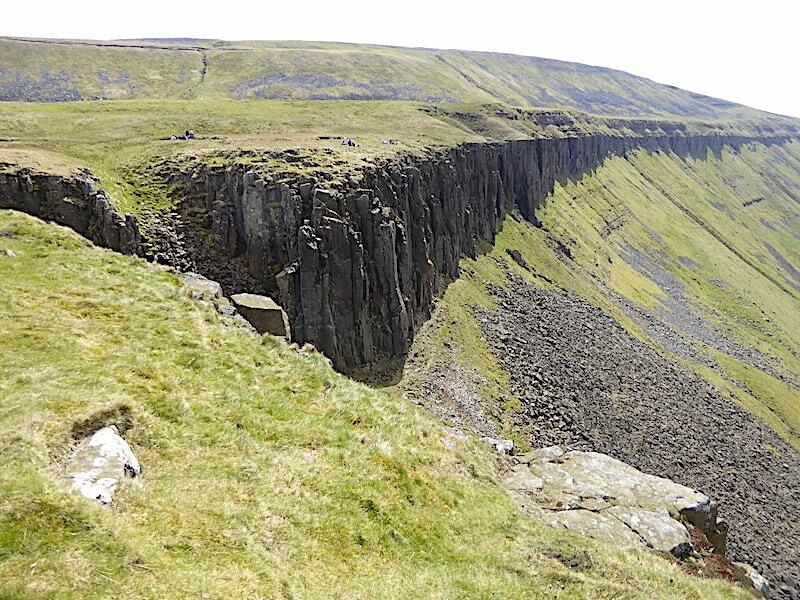 All that changes as we continue on above High Cup Scar. 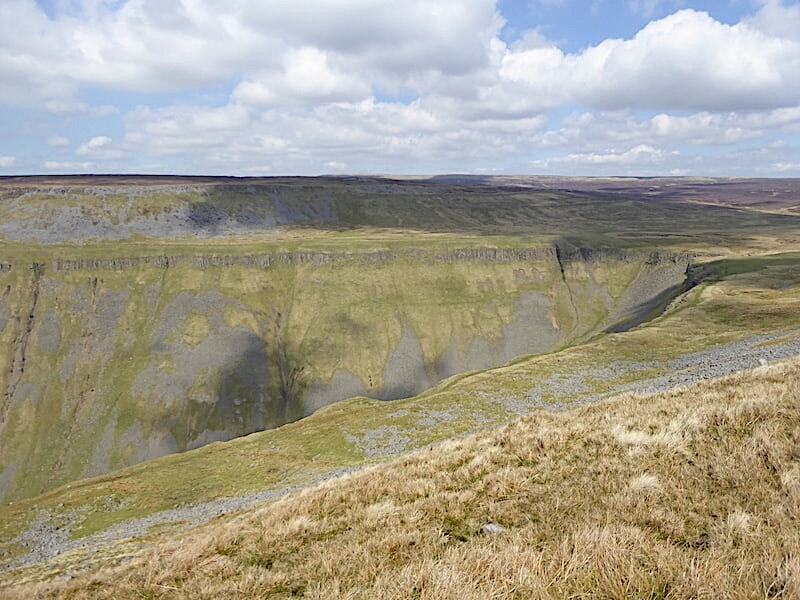 There were walkers making their way back along the lower path along the rim of the scar below us, and plenty of others on the path coming up from Dufton on the opposite side of the gill. 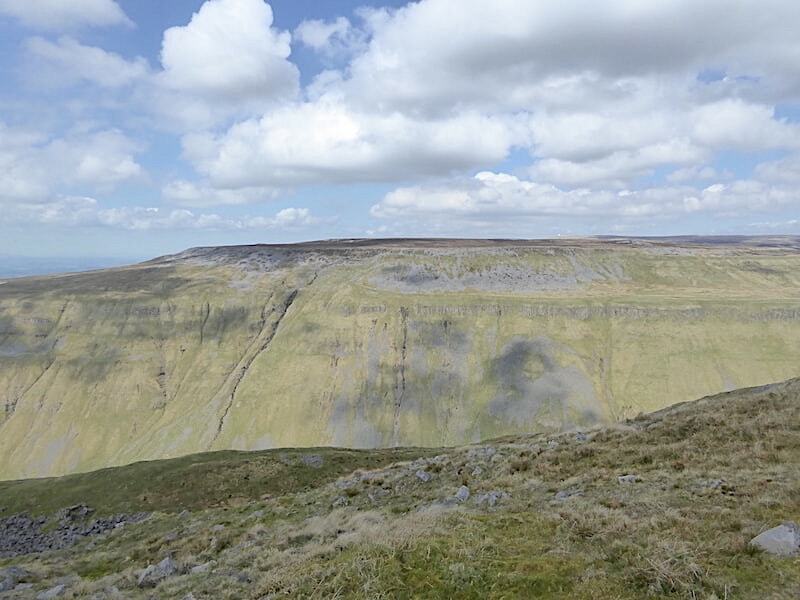 High Cup Nick at the head of the gill. The path continues on to join The Pennine Way but a little further on we drop down to the left beside a little beck and make our way across to High Cup Nick. 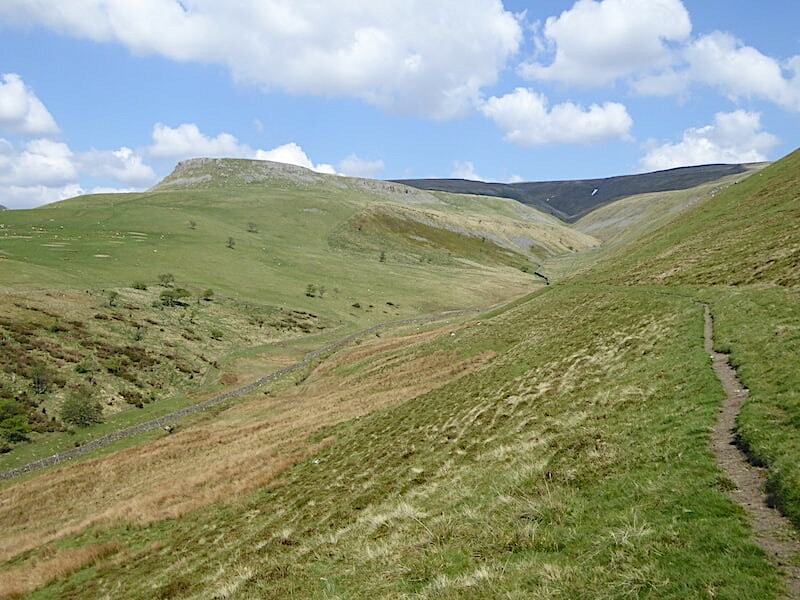 High Cupgill Head, with High Cup Plain beyond, where we cross the beck and head for the grassy bank opposite. Before going over to gaze at the dramatic view we plonked ourselves down on the grassy bank and tucked into our lunch. After our break we carried on across the top where quite a few others were also doing the same thing while gazing down at the stunning sight below them. 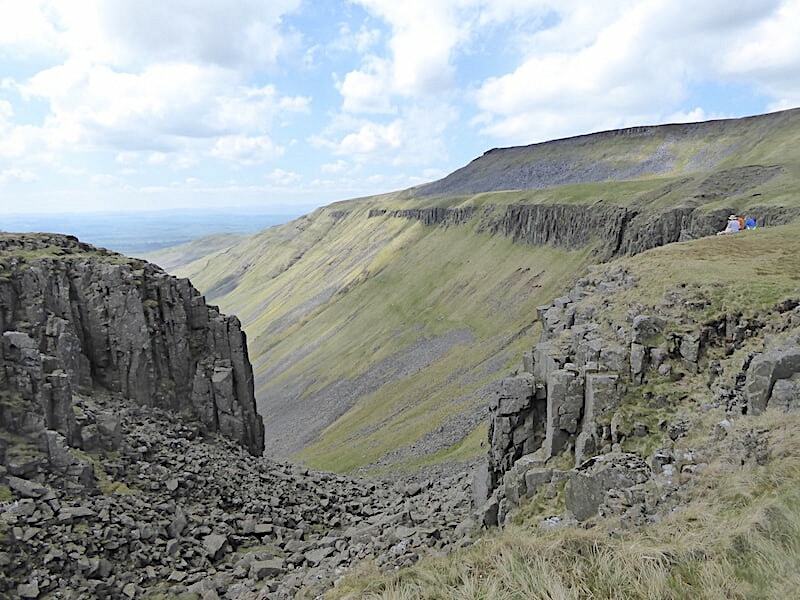 The spectacular view along High Cup Gill …..
….. with its imposing rock towers …..
….. down both sides of its length. The little beck above the little group of walkers towards the left is the one we followed as we dropped down from the higher path along there. Even when there are quite a lot of people around it never feels crowded up here since there’s an abundance of wide open space to wander around in. We spent a while just looking and marvelling before crossing the beck once again. 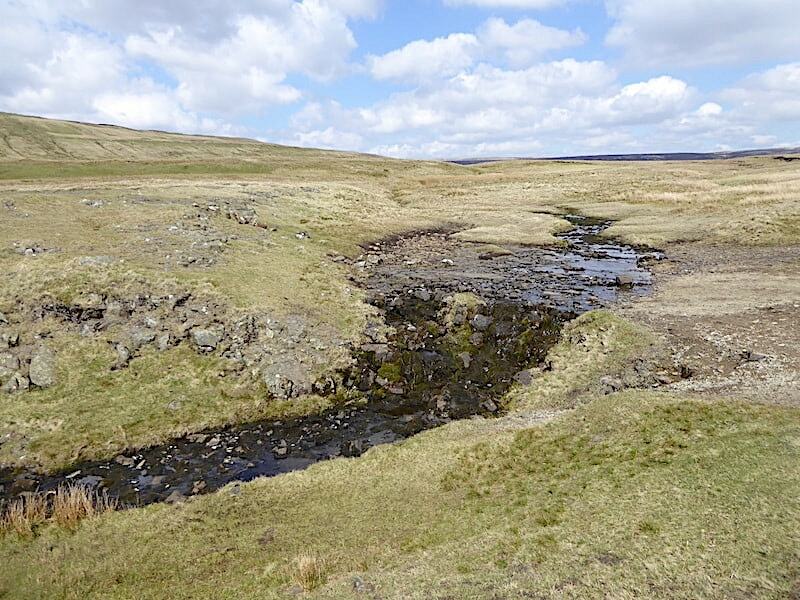 The water in the beck disappears beneath the jumble of boulders and reappears further down the valley. 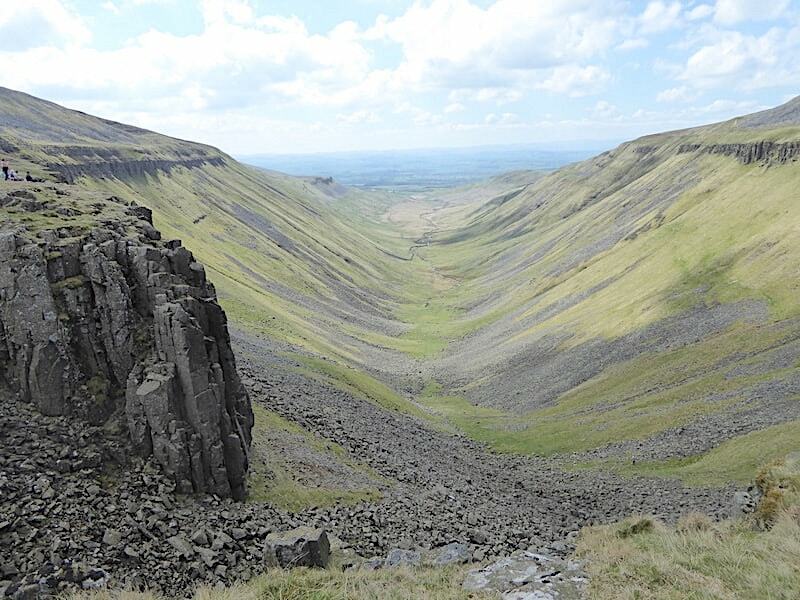 We make our way back using the lower path hugging the rim of High Cup Scar which offers some very up close and personal views of the magnificent rock towers along its length. Best not to get too close to the edge though because its a heck of a long way down. Looking back along the rim of the scar from the path, a breathtaking view despite the large cloud which was now hanging over us. 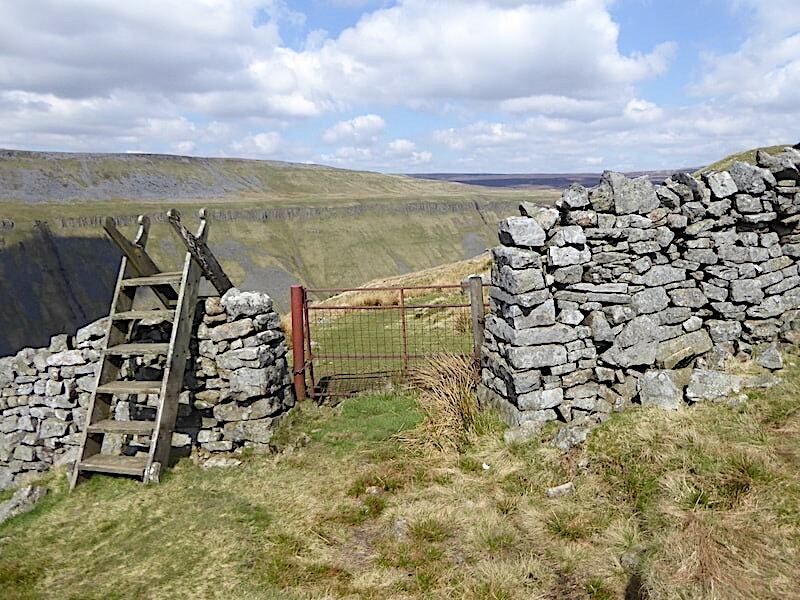 A ladder stile marks the end of the path along the rim and here there is the option of making the short climb back up to the higher path and returning by the same route, or continuing straight ahead and making our way back down Middle Tongue. 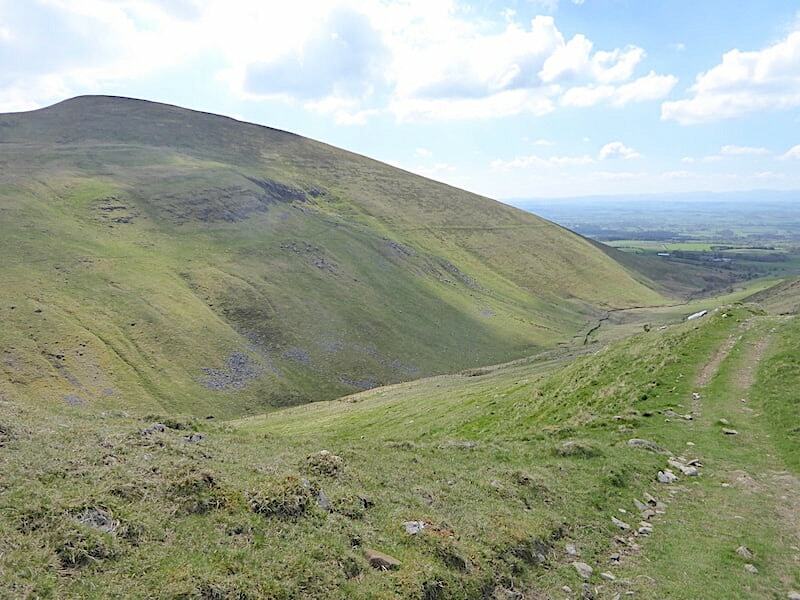 We take the Middle Tongue route just to vary the walk a little, and begin the return leg down the clear grassy route. 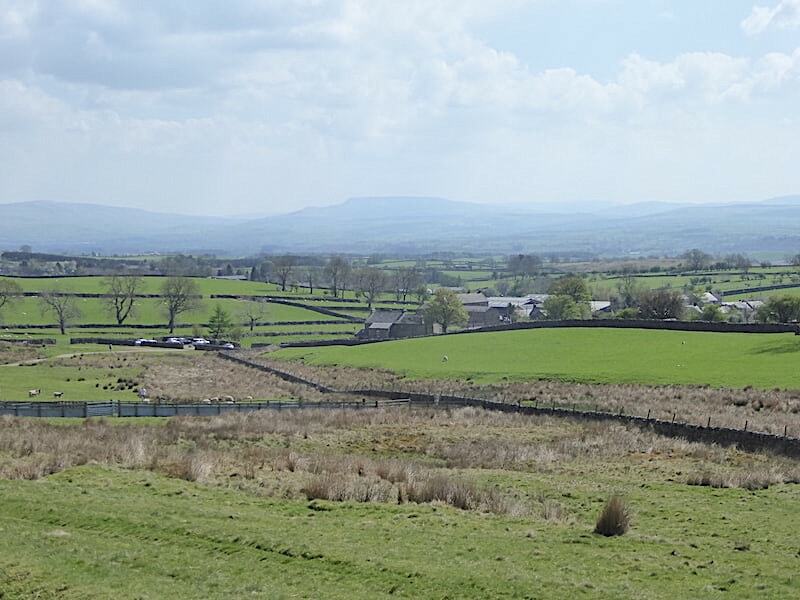 Murton Pike is now back in view over on the left. 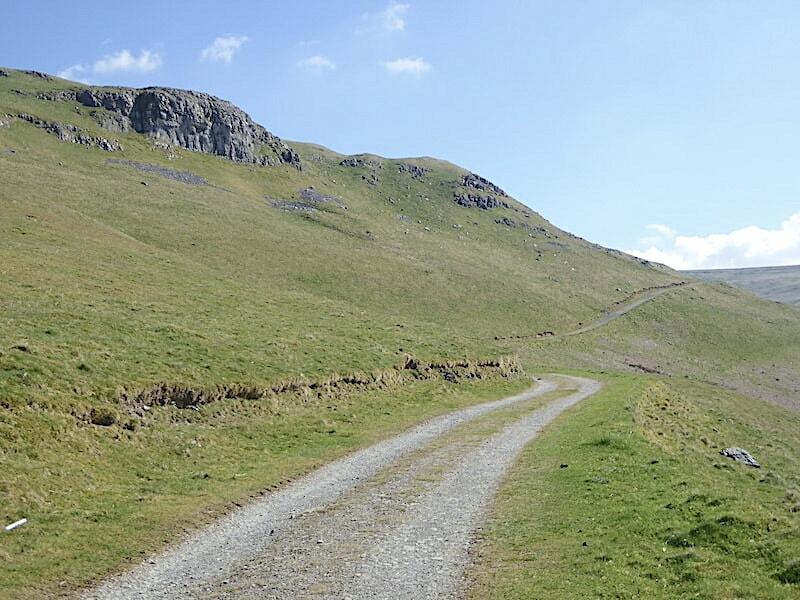 There are no waymark posts along the route but what seems to be a farmer’s quad bike track is clear enough to see as it swings us over towards Trundale Gill once more. 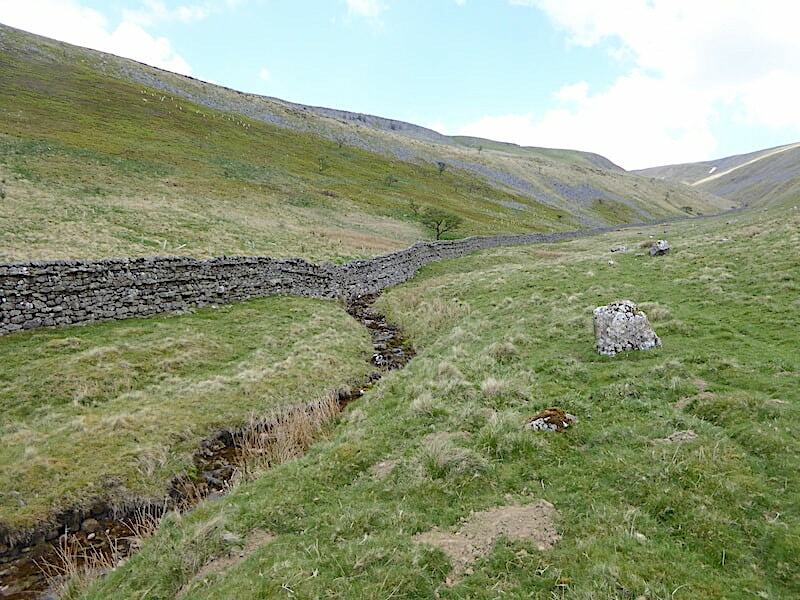 Rather than follow the quad bike track all the way back to Harbour Flatt …..
….. we bear left a little further along, following the line of a fence, and drop down to the wall alongside Trundale Gill. 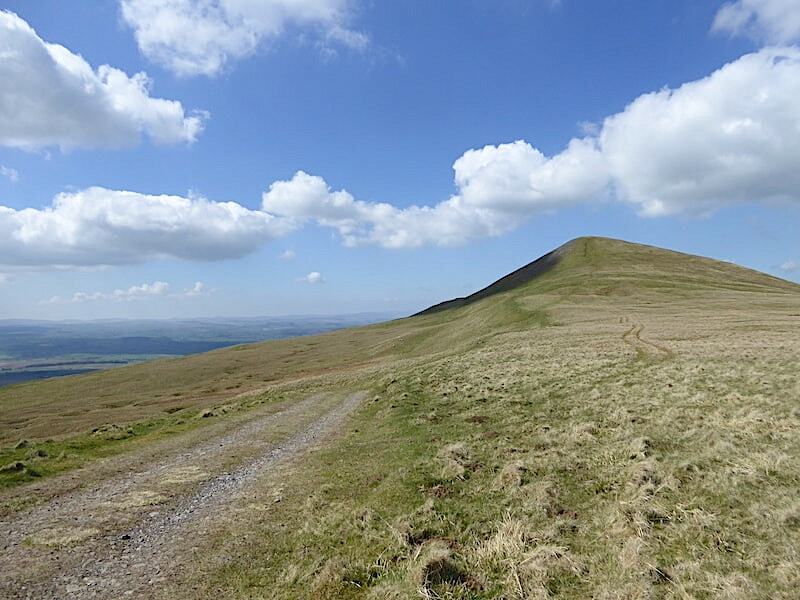 We are aiming to cross the gill and pick up the lowest path across the slopes of Murton Pike. 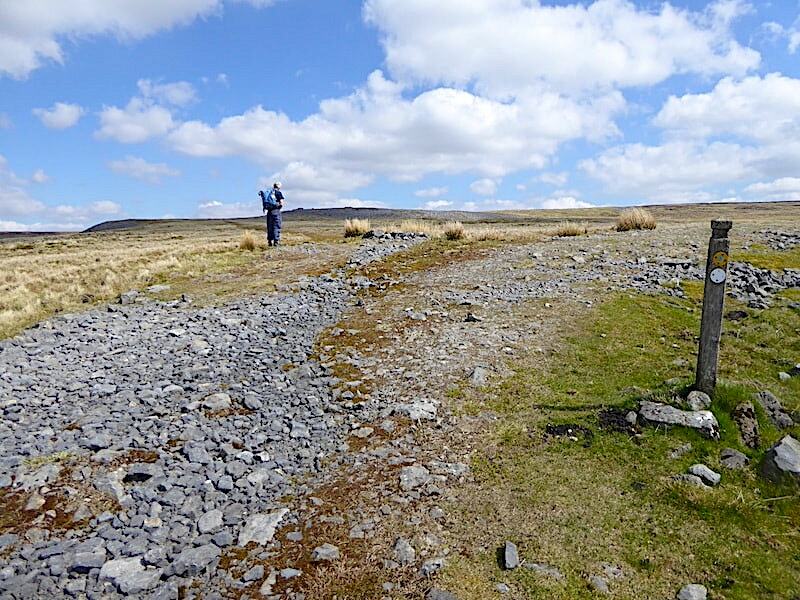 The wall dipped slightly lower where it crossed the gill so we made that our crossing point. A little tricky since the ground was higher on the far side of the wall, which provided an easy start, but then dropped much lower on this side which made things a little more awkward for those of us in the short limbed category. 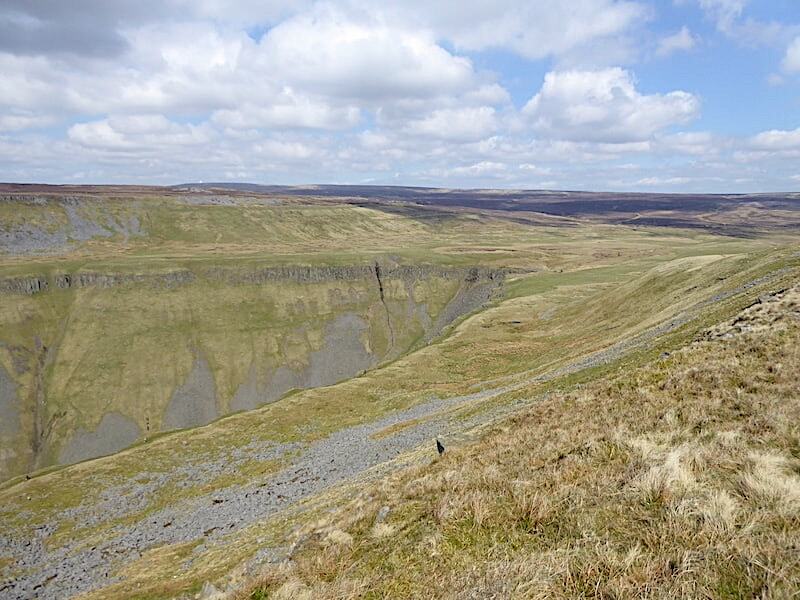 We climb away from the gill up to the path from where I took a look back at our route. 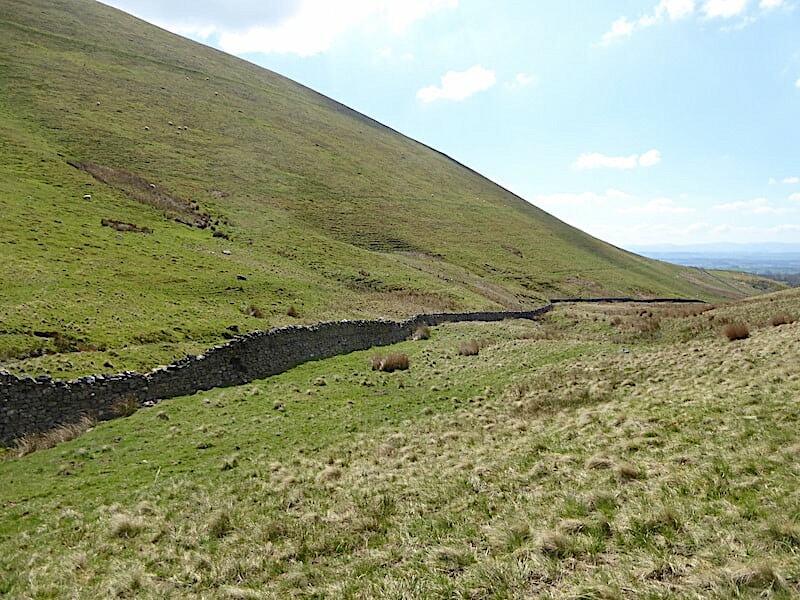 We passed below Middletongue Crag, up there on the skyline, walked down alongside the fence enclosing a small plantation of young trees and then followed the fence line all the way down to a gate. We passed through the gate and just a little further along from it reached the wall crossing point. 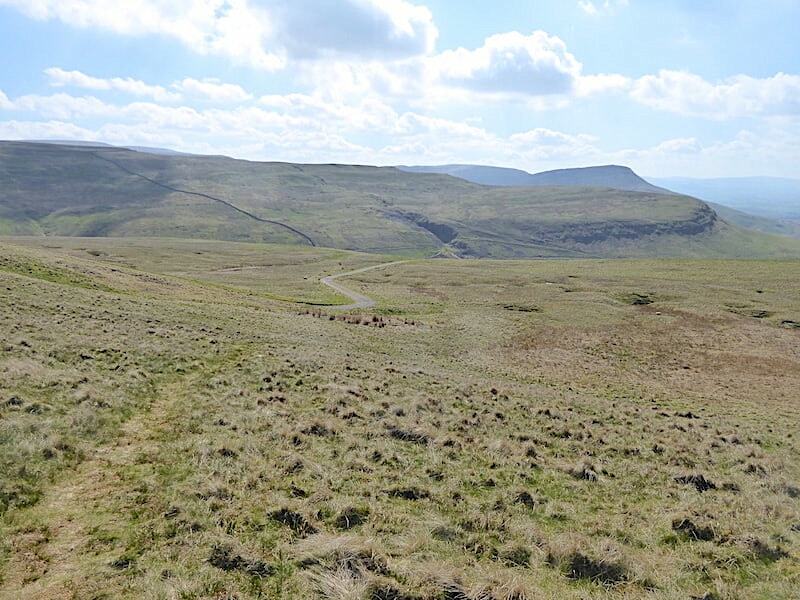 Views of Dufton Pike and Peeping Hill as we follow the narrow path just above Trundale Gill. 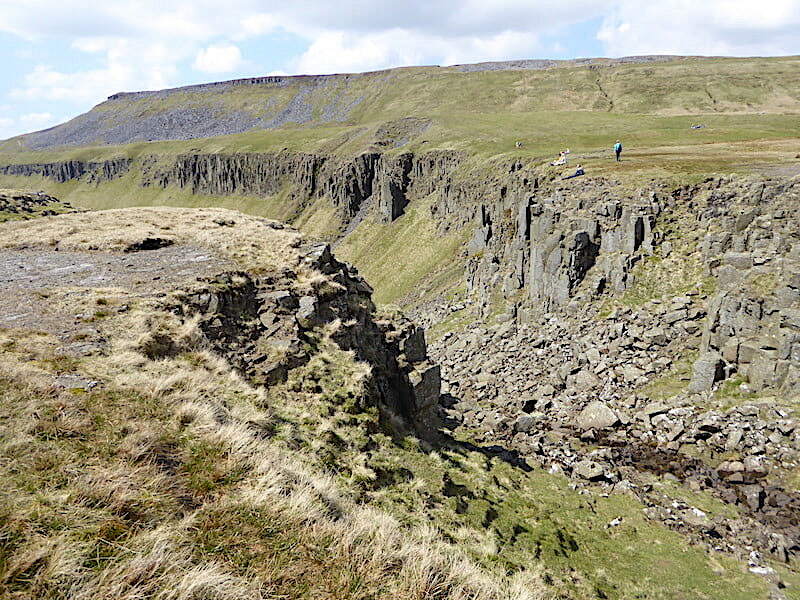 The view back to Middle Tongue and Trundale Gill from the narrow path. 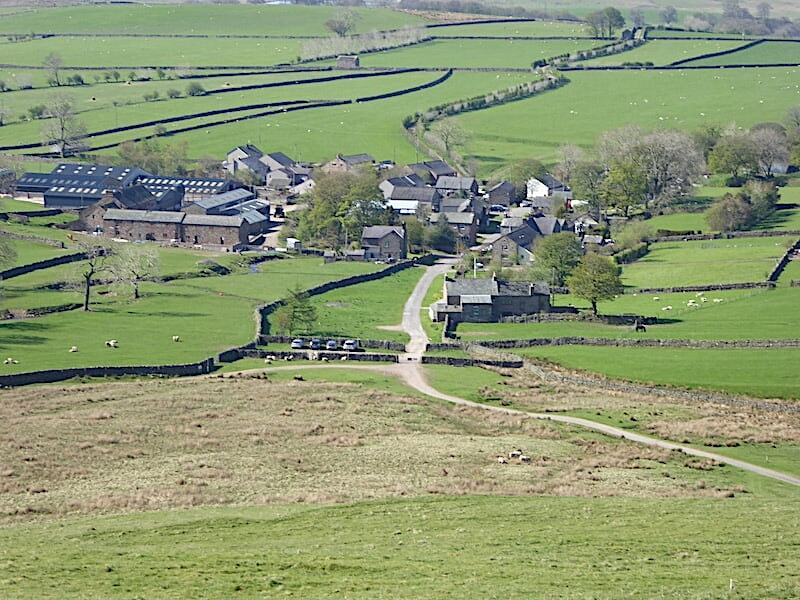 A view of the farm at Harbour Flatt and Dufton Pike as the path swings back round towards Murton village. We reach drier ground after negotiating a very boggy section a little way back and the going is now very easy all the way back to the village. 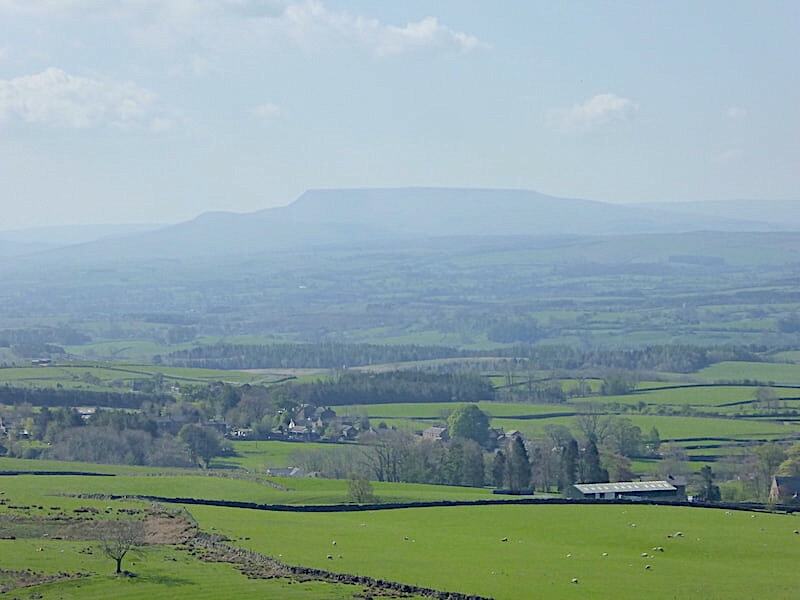 Almost back to Murton with a now very hazy view of Wild Boar Fell on the skyline. Its still a lovely warm afternoon but the haze has increased considerably during the day so the long distance views were not so good. 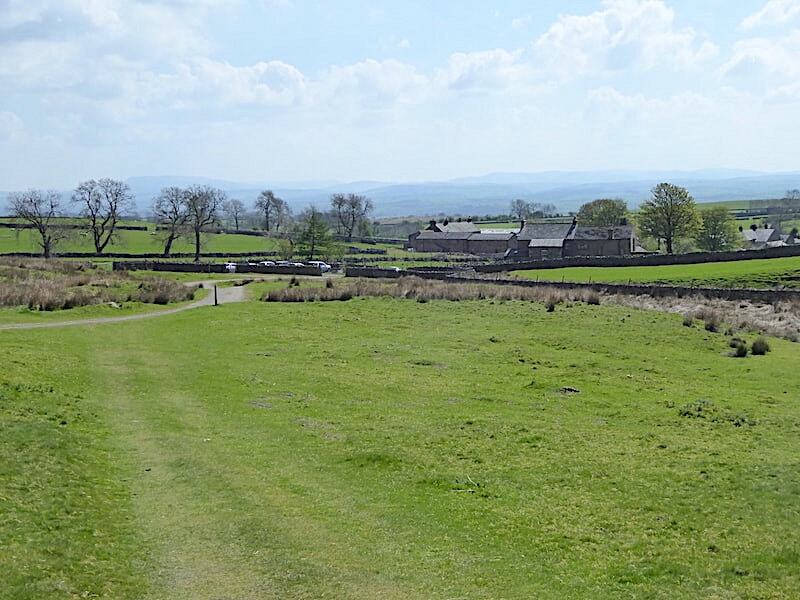 Our grassy path comes to an end and joins the track coming up from the car park. Some of this morning’s cars have gone while others have arrived, even so there were still plenty of spaces to park. 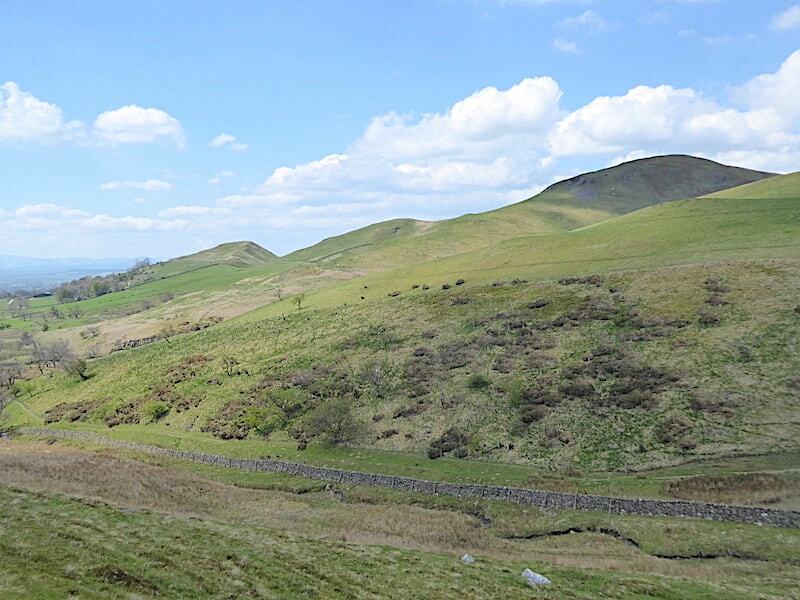 Before heading over to the car here’s a view of Delfekirk Scar and Roman Fell just to round off today’s very enjoyable walk. 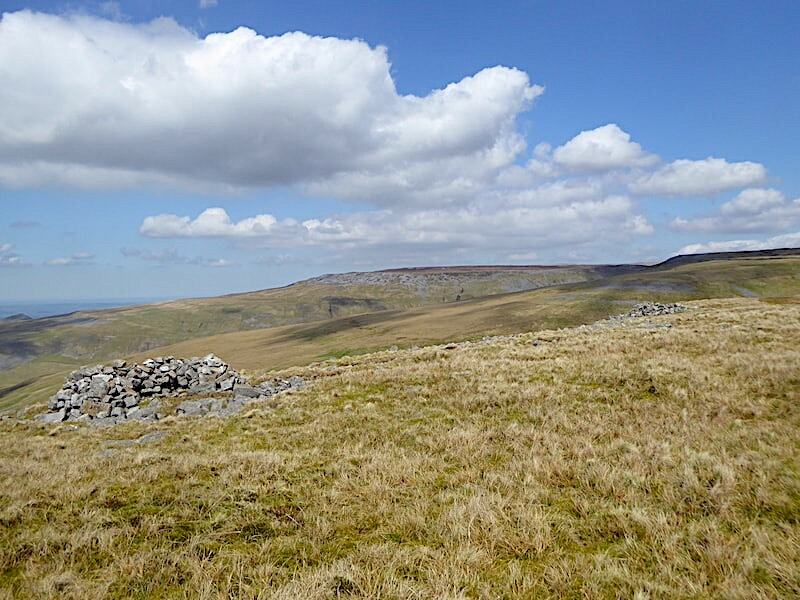 The weather was lovely and the wide open and uncrowded landscape was a delight to wander over. 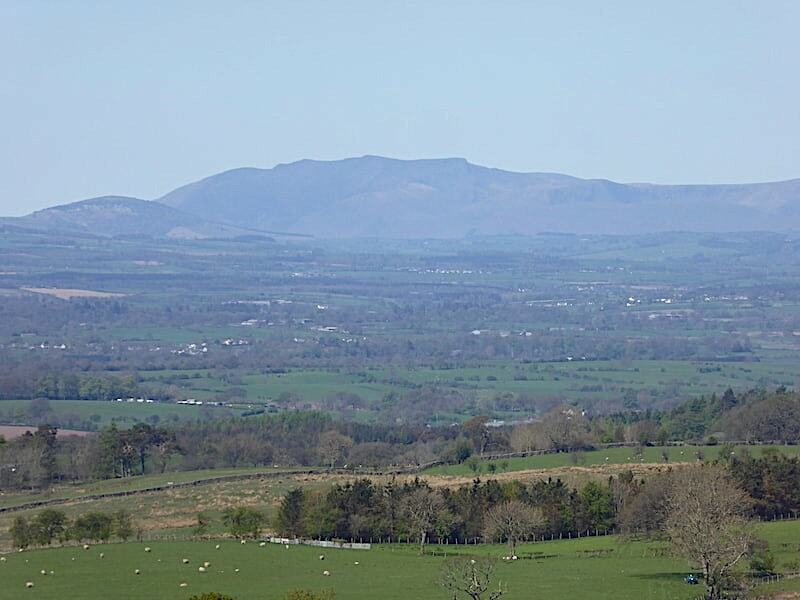 So now its time we trotted off back home for a refreshing cup of tea and get ourselves rested in readiness for another walk tomorrow when apparently its likely to be much hotter than it was today. How different things were just a handful weeks ago when we were wrapped in full winter gear, now I’m in shorts and t-shirt and wondering if the sun cream will last out.